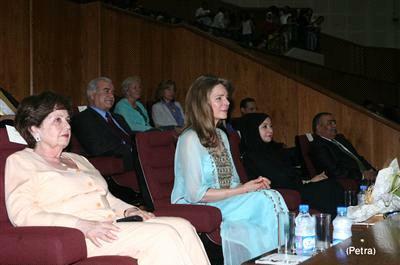 AMMAN - Her Majesty Queen Noor patronized on Monday evening the opening ceremony of the 30th International Arab Children’s Congress (IACC). The one-week event, which is held under the title "Safeguarding our Environment", groups teenagers from 22 countries to tackle various environmental issues. The IACC is held annually by the King Hussein Foundation’s National Centre for Culture and Arts (NCCA) with the aim of shedding light on common challenges facing young people worldwide. Queen Noor delivered a speech in which she underlined the importance of the theme of the current year's congress, stressing the need to unify efforts to confront environmental challenges. During the gathering, the participants are expected to discuss the impact of pollution and global warming on public health, the economy and social development, in addition to alternative energy and the application of green building practices to protect the environment. The opening ceremony, which was held at the Palace of Culture at Al Hussein Sports City included musical performances presented by the NCCA in cooperation with Jordanian singers Amer Khufash, Rose Werr and Rami Shafik. UNICEF goodwill ambassador Lebanese singer Nancy Ajram and Jordanian actor Moussa Hejazin, who are this year’s guests of honour, attended the opening. During the congress, the participants are scheduled to take part in several interactive painting, drama and music workshops, and will tour the country’s main tourist and cultural heritage sites. Queen Noor initiated the congress following the 1980 Arab summit in Amman, with the goal of giving children aged between 14 and 16 years the opportunity to express their needs and aspirations and to be heard by decision makers in the Arab world.